Is Cameron the greatest pro-European of all EU heads of state and government? As we've noted, the Juncker-hangover is already taking hold in parts of the German commentariat. In a hard-hitting piece, Lisa Nienhaus, the Economics Editor of Frankfurter Allgemeine Sonntagszeitung argues that the EU "needs more Cameron, not less". "Hang on a minute, how exactly [was Cameron's opposition to Juncker] a mistake? He only said publicly what many think. Juncker may well be a jovial, cheerful bloke, but he is also an example of political mediocrity, who represents more of the same, a lack of ideas. Whoever wants to change Europe, and above all the opaque, hyper-bureaucratic European Commission, needs someone else in that post." "Cameron did exactly the right thing. He did not only win the hearts of Brits but also of citizens in many other countries who worry about what will ultimately remain of the European Union, a bureaucratic entity that offers occupational therapy and valediction opportunities for veteran politicians. In this sense, Cameron is the greatest pro-European of all the heads of state and government." "The Germans, for example, did not vote for the European People’s Party (of whom Juncker was the leading candidate) but the CDU. Juncker did not feature on the posters, it was Merkel. It is not the case that voters would have driven crazy if Merkel had ultimately arranged that someone else would have become the Commission President. In doing so, she would have shown that she takes this post seriously. Now she has only shown that she doesn't really care who takes this job." "The heads of state and government are ultimately at least as democratically legitimised as the European Parliament. After all, they won national elections in their respective countries." "We can only hope that Angela Merkel does not take offence at [Cameron's] 'No’. We need the Brits in Europe, also for other reasons. The belief of the Brits that freedom is good for the economy, and that not everything has to be regulated by the state, is exactly that what the EU is currently missing." "The suspicion among the Brits that the powers that have won want to initiate a redistribution of powers and favour a super-powerful state is widespread. That does not appeal to the liberal Brits. Those in Germany who share this view – and there are many – has to support the UK playing a greater role in the EU. We need more Cameron, not less." Neinhaus's line is not universally accepted in Germany of course. Others have been sticking the boot into Cameron. Nonetheless, Berlin will be aware that last week’s EU summit is a foretaste of what life in the EU could be if the UK were to leave. Without Britain in the EU, Germany would face a bigger risk of being cornered by a block of Southern eurozone countries lead by Italy and France: something that is absolutely not in its long-term interests. 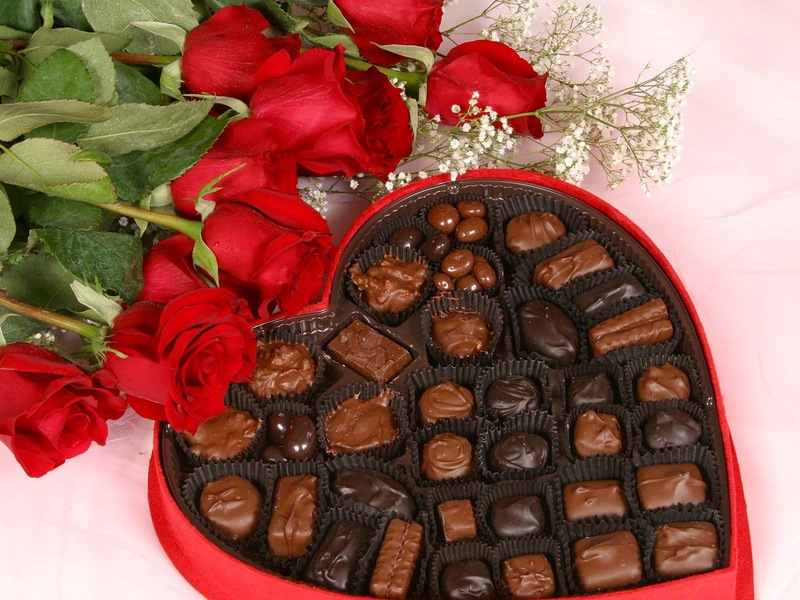 After the row: is Germany bringing the flowers and chocolate? The dust from last Friday's extraordinary EU summit - the first at which an EU leader was actively outvoted over the appointment of the European Commission President - is starting to settle. As strong emotions recede, pragmatism is coming to the force both on the UK side - with David Cameron saying he is ready to put aside his differences with Juncker - and also on the continent and particularly in Germany. Significantly, both German Finance Minister Wolfgang Schäuble (CDU) and German Vice-Chancellor Sigmar Gabriel (SPD) warn about the impact of a UK exit and stress the importance of the UK to the EU. "If we don’t manage together, over the coming years, to modernise Europe, make it less bureaucratic, respect national, regional and municipal responsibilities, then a large bourgeois majority of Britons – pushed by UKIP – will vote against Europe…The UK’s exit from the EU would signal the beginning of the end of the European project." These comments show that - as we argued in our instant response to the Juncker appointment - it's all still to play for when it comes to EU reform. Will there be a post-Juncker Brexit bounce? The Mail on Sunday had the first poll (by Survation) following David Cameron’s summit defeat over Juncker’s appointment as European Commission President. The top line is that 47% of Britons want to leave the EU, with 39% in favour of staying in. Given the recent trend of polls finding majorities for 'In', this is quite a striking change. However, a YouGov/Sunday Times poll (note that the fieldwork was conducted before the summit) showed attitudes to Brexit more or less unchanged, with 39% in favour of in, unchanged from a week ago, and only 37% in favour of out, actually down from 39% last week. Other results form the Mail on Sunday poll would suggest that the Juncker episode has had a limited impact: 60% said Juncker's appointment would not change how they plan to vote in an In/Out referendum, while only 30% said it made it more likely they would vote to leave and 10% said they would be more likely to vote to remain. Interestingly, the extent of German influence in the EU has not gone unnoticed. Asked who would have more influence over how the EU is run over the next few years, 50% said Angela Merkel, just 9% David Cameron, 11.5% Jean-Claude Juncker, and just 1.6% Francois Hollande. It will be interesting to see further post-summit polls to see if the rise of the Brexit vote is an outlier or whether things have changed (even if only temporarily). UPDATE (11:30am) - In a separate interview with Quotidiano Nazionale on Saturday, Mr Del Rio explicitly speaks of a "great victory" for Italy at the EU summit. "The green light to flexibility is the great victory [...] One needs to acknowledge that, thanks to Italy, the work of the summit was not focused on names, but on what to do to move from the time of austerity [rigore] to the true implementation of the [EU's] Stability and Growth Pact. We really won a substantial battle." The battle to make EU fiscal rules more 'flexible' was one of the key issues on the table at last week's European Council summit. Italian Prime Minister Matteo Renzi and French President François Hollande were seeking to make their support for Jean-Claude Juncker conditional on a de facto loosening of the rules. So what was the outcome? Well, depends on who you ask. If you ask Renzi's people, this weekend saw a watering down of the rules. Q: Italy comes back from Brussels with the rule of the 'best use' of the flexibility already provided for [by the EU Treaties]. Isn't that too little to speak of a Europe that abandons austerity and of a victory of the Renzi government? A: No, it's not too little because it is precisely the lack of use of flexibility that has caused our most serious problems. Q: So, during its semester of [rotating] EU Presidency, Italy won’t ask to raise the [EU's] deficit limit, the famous 3% of GDP? A: I don’t think that’s a rule set in stone forever, but we don’t want to be the ones who move it onto sand. No, we won’t ask to raise the 3% [deficit/GDP threshold]. That’s also to avoid suspicions and titters in Europe, keeping in mind that there are other countries that glaringly breach that limit – and even Germany has done it during a certain period of time. Q: Excuse me, but what does this greater flexibility mean then? A: It means that, when deficit is calculated, part of the spending is not taken into account, or, better, it is considered as flexible. The [EU’s] Stability Pact effectively becomes looser. It can be done for co-financing, that is the money Italy is obliged to spend to use EU funds. We’re talking about a figure around €7 billion a year. But there’s also the investment clause, that would allow [us] to leave out of the calculation spending with a high social impact […] We’re talking about a figure around €3 billion. In total, flexibility could be worth €10 billion a year, although it can’t be taken for granted that these two items can be added together. Of course, everyone is talking about 'interpretation', and no-one will say the rules have been formally re-written. Still, this looks as if the Italian government is claiming they have managed to loosen EU fiscal rules, via a new interpretation. Spin or otherwise, Berlin and Frankfurt won't be entirely pleased. The Juncker row: Were there any concessions to the UK and what happens next? The UK suffered a major defeat this afternoon when it was outvoted over Juncker becoming the next president of the European Commission. However, this isn't the end of the road for reform – not even close – but it certainly has strengthened the risk of Britain leaving the EU. See here for a our full analysis of this. Any of this significant? It’s the basis for a conversation but can mean anything and nothing at the moment. It falls way short of compensating for the defeat inflicted on Cameron. As we argue, it all depends on what happens next. "In line with the principles of subsidiarity and proportionality, the Union must concentrate its action on areas where it makes a real difference. It should refrain from taking action when member states can better achieve the same objectives. The credibility of the Union depends on its ability to ensure adequate follow-up on decisions and commitments. This requires strong and credible institutions, but will also benefit from closer involvement of national parliaments." Again, hardly earth-shattering. So what happens next? Will there but further nods to Cameron over the next few days and weeks? 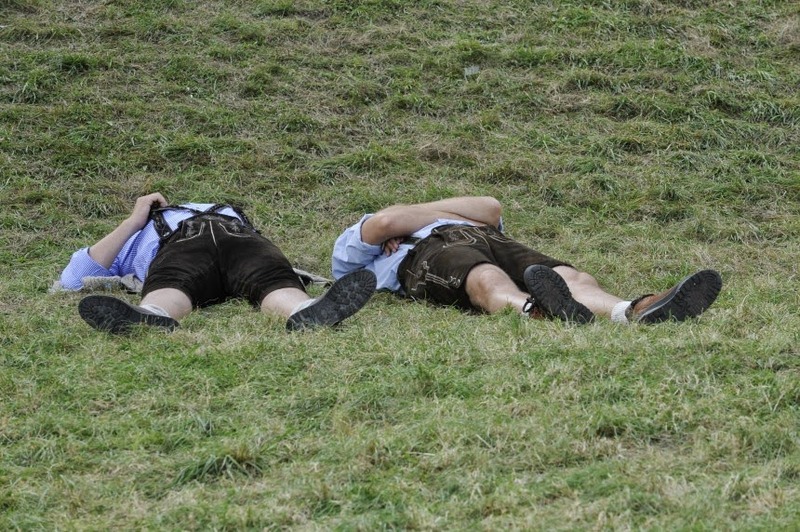 There’s already talk of Merkel, Hollande and Cameron doing something jointly. Who will become the European Council President? This is in many ways the person who will broker the agreement between EU leaders that will decide whether the UK will stay in the EU. This will be decided at an EU summit on 17th June. The other portfolios in the European Commission and who will become the UK’s candidate. Surely, Cameron must now respond by sending a big hitter to secure a top job? MOST IMPORTANT POINTS FROM #MERKEL #EUCO PRESSER: (1/3) "Ever closer union" does not mean one-speed Europe. MOST IMPORTANT POINTS FROM #MERKEL #EUCO PRESSER: (2/3) #spitzenkandidaten process will have to be discussed in #Council. MOST IMPORTANT POINTS FROM #MERKEL #EUCO PRESSER: (3/3) "flexibility" on fiscal pact does not mean member states get to re-write the rules. 1. The UK raised some concerns related to the future development of the EU. These concerns will need to be addressed. In this context, the European Council noted that the concept of ever closer union allows for different paths of integration for different countries, allowing those that want to deepen integration to move ahead, while respecting the wish of those who do not want to deepen any further. Once the new European Commission is effectively in place, the European Council will consider the process for the appointment of the President of the European Commission for the future, respecting the European Treaties. Italian Prime Minister Matteo Renzi was particularly keen to claim victory on a more 'flexible' application of EU fiscal rules. Van Rompuy’s agenda for the next European Commission is “very very very good on substance. For the first time, the focus is on growth. Insisting on growth is a turning point for Europe,” he said. Read our take on what Cameron's defeat means for the reform agenda here. What do Wayne Rooney, Rambo and Don Quixote have in common? The script is written and the scene is set: Cameron will go down fighting in his bid to prevent Jean-Claude Juncker from becoming the Commission President with only Viktor Orban for company. While this has earned him some relatively positive headlines in the British press, the German press has not wasted an opportunity to stick the boot in. "Great Britain and Hungary - this is not the strongest alliance in the EU. This could be a foretaste of what could happen if the Brits decide leave the EU in the 2017 referendum announced by Cameron. Instead of taking part in the largest and most economically significant association of states in the world, the Brits will be locked outside. The relevance and influence of Great Britain will fall dramatically." Of those three, we suspect Rambo is the most favourable comparison, even if it was not meant as such. At least, Rambo is usually the only guy left standing once the credits start to roll. 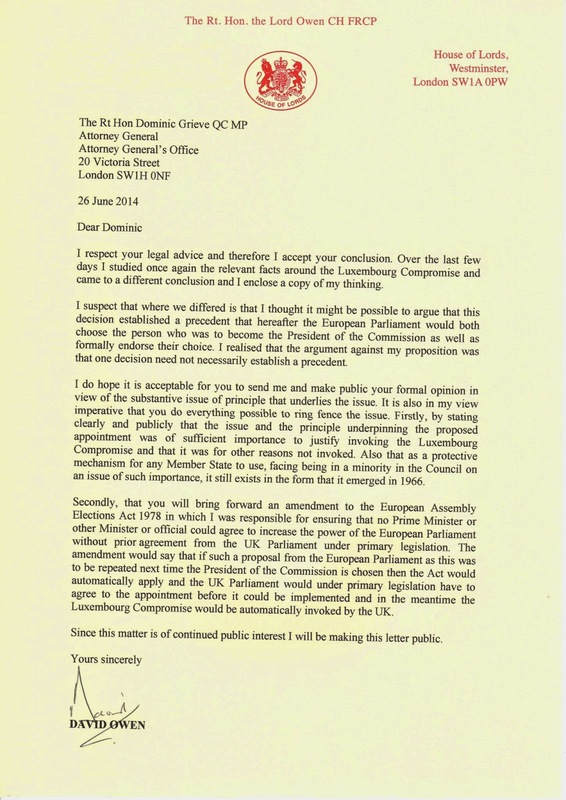 The Following letter from Lord Owen and article explaining why he believes the UK should invoke the Luxembourg Compromise are published by Open Europe. 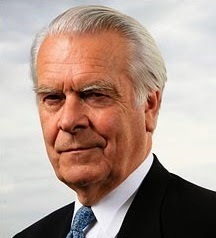 LORD OWEN BELIEVES THE PRIME MINISTER IN BRUSSELS SHOULD INVOKE THE LUXEMBOURG COMPROMISE. La France n’a jamais renoncé et ne renonccra pas au droit de protéger en case de crise grave ses interets fondamentaux. Demeure done l’engagement mutual des Etats de continuer a chercher un accord entre eux tous quand l’unanimite n’aura pas pu etre recueilie et que l’application de la regle majoritaire mettrait en cause les interets jugés vitaux par l’un d’entre eux. Also in his speech he went on to say that any formalisation of the Compromise would “denature” the mutual commitment to seek agreement and render it less effective as a safeguard. Neither the European Commission nor the Court of Justice have ever accepted the Luxembourg Compromise but nor has the European Council ever renounced the existence of the Compromise and their potential use of it. Neither of these positions are in any way surprising. There is and has been throughout the existence of the European Community, and now the European Union, a fundamental tension between supranational decisions and those taken by the nation states. The invocation of the Luxembourg Compromise saved the European Community in 1966. The Council conclusions stated that if one member state considered that “a very important national interest” was at stake then the Council would endeavour to reach within a reasonable period solutions that could be adopted unanimously. It is often referred to as a vital national interest. But that was not the wording that was used. The French view when very important issues were involved was that “discussions must be continued”, but this was not accepted by the other member states and that difference of opinion was noted and has remained ever since, perhaps because all such disputes have eventually been resolved. President Hollande, in the light of what happened in France in the recent European Elections, would be playing with fire if he was not to support David Cameron’s right to invoke the Luxembourg Compromise. First and foremost, because it is by any standard “a very important national interest” for the UK. Firstly, because in Article 17 of the Treaty on European Union, it is very clear that members of the Commission “shall neither seek nor take instructions from any government or other institution”. That includes the European Parliament. It is essential that in both substance and in form the President of the Commission is seen to be able to serve the interests of the peoples of Europe, the European Commission and the Europe Council of Heads of Government. The wording of the Treaty in relation to the choice of the President of the Commission it is claimed by some lacks clarity. The drafter of the words Lord Kerr, who was then Head of the Secretariat established by Giscard d’Estaing to draw up a new Constitution, has rebutted that argument. 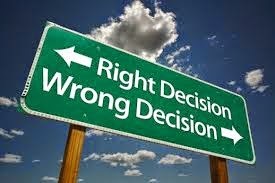 The procedure for choosing the President, in the words of Professor Alan Dashwood, a Europe-wide acknowledged authority on these matters, and some others, “separates the right of initiative from the right of final decision”, a separation of functions which they rightly claim is characteristic of the Treaty system. The European Council is, therefore, very clearly charged with identifying the individual they consider best suited to be President of the Commission and they are charged with taking “into account the elections to the European Parliament”. The individual heads of government are, therefore, left free to determine what taking into account exactly means. It is pretty clear that David Cameron believes that he should give the greatest weight not to the choice of the largest parliamentary grouping – in this case the one that is chosen as their candidate, Mr Juncker – but also the extraordinarily high vote in many member states for candidates who want substantial changes in or are even doubtful of continuing as members of the European Union. In that choice of priorities there is little doubt that he is supported by the British people and by the majority of Members of Parliament. But there are other powerful constitutional arguments as well that should, and probably are, guiding the Prime Minister. No British Government is entitled to increase the powers of the European Parliament under Section 6 of the European Assembly Elections Act 1978 until there has been prior approval by an Act of Parliament. Agreeing in the European Council to endorse the choice of the European Parliament could certainly be subject to challenge in Parliament as going beyond the power of the Prime Minister in relation to the Act. He has already made a very substantial change in the British position over the future of the European Union. Ever since the collapse of the Eurozone the coalition government with the support of the official Labour opposition, have made it clear that the UK will not block such steps in the federalisation of the Eurozone that its members wish to take in order to preserve the Eurozone. In order to carry support for that position, which is a constructive one, which is also judged to be in the British national interest, it is imperative that there is no further move towards federalisation of the EU itself affecting non Eurozone members and in particular the UK. There cannot be any doubt whatever that if Mr Juncker were chosen by majority vote in the present political climate it would be seen as a significant victory for those who believe that a federal union is the ultimate destination of the EU. That view is a legitimate one but is not one that I have ever shared while remaining a committed European. I believed in the validity of the federalist warning by the Labour Leader, Hugh Gaitskell, in a TV broadcast in 1962 and it has been amply justified by the trend of events over the last 52 years. There are today, we know, not just from opinion polls but from votes actually cast in the most recent European Parliamentary Elections, many people who are worried by the federalist direction in the European Union as a whole. If we ignore that sentiment then it will feed on itself. There have been many fine Europeans who have advocated federalism from day one, but the fact is there is nothing in the Treaties, and hopefully there will never be anything in the Treaties, that determines a federalist destiny. The EU is an evolving institution and there are many indications that its citizens want some of the decisions that have been taken in Brussels to be returned to the nation states. There is a widespread feeling that the European Commission has become too federalist and that the true democratic interpretation of the European Elections is that all the institutions, and I include the European Court of Justice, must pay greater regard to this reality in its interpretation of the Treaties. It is in this situation that the existence and invocation of the Luxembourg Compromise is fully justified and were it to be rejected then the British Prime Minister would be bound to take further actions following precedents first established by President de Gaulle, but which have also been followed through by other Presidents and Prime Ministers. The Juncker row: Will Cameron now be forced to say he's willing to recommend 'Out' in a referendum? 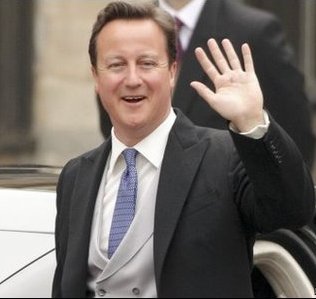 Could he merrily wave the EU goodbye? There has been much said about David Cameron's supposed "threat" to leave the EU, reportedly delivered to Angela Merkel in a discussion over whether Juncker should become President of the EU Commission. There are good reasons to doubt the specifics of the report, because the source probably had ulterior motives: to damage David Cameron's campaign to dislodge Juncker. The theory being, the prospect of a Prime Minister "making" a threat would so upset EU sensibilities nobody would dare stand with Cameron's campaign. Having said that the story does have two elements of truth to it. Firstly, all polling shows that EU reform is the decisive factor in determining whether Britons would vote to stay in the EU. David Cameron could easily have pointed out that Juncker's appointment - an obvious example of non-reform - would damage the chances of an 'In' vote. But is that a threat - or a fact? 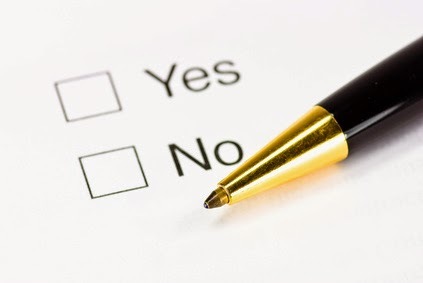 Possibly, if David Cameron was the only person planning to vote in his planned referendum, but he is not. So, if it is a threat, it is a collective one from the British people. The outcome of the Juncker saga may be that Cameron has no choice but to say he's willing to recommend "Out". But hey, the nature of the referendum is that it won't be his choice anyway. Imagine you woke up in a state where the head of the civil service was elected – but not by you. Imagine a state where the top governmental positions were settled in deals in meetings to which your elected representatives were not invited. Imagine that this system had been introduced without your approval. Well, you may soon be living in it if Jean-Claude Juncker becomes President of the European Commission. So what should David Cameron do? His options are limited; the UK lost the veto on this appointment under the terms of the Nice Treaty in 2001. He can vote against, but cannot prevent himself being outvoted. This is a major problem on two levels. First, by appointing Juncker EU member states have conceded the precedent that the European Parliament is now responsible for selecting the Commission President. This will politicise the Commission, and make it subject to perennial Brussels political deals between MEP factions. 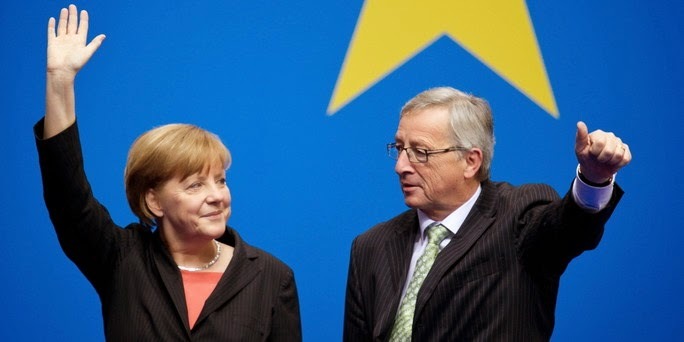 Juncker’s route to power has been paved by a series of such contradictory deals cut firstly with the Christian Democrat EPP; then the Socialist S&D; then, reportedly, the Socialist Prime Minister of Italy and French President – and allegedly the German mass circulation Bild newspaper. Needless to say, this bears no relation to the results of the recent European Elections and is a straightforward power grab. It is a cession of power not authorised or even discussed in the UK Parliament. Beyond the principle and the person, Juncker’s appointment presents a strategic headache for David Cameron and his Europe policy. The assumed policy is to provide enough tangible evidence that the EU can reform to allow Cameron to advocate an ‘In’ vote in his promised 2017 referendum. In doing so, he has bet the farm (or the UK’s EU membership) on his belief that other member states, notably Germany, will wish to bail him out. Juncker’s appointment is a clear message that he cannot always rely on his fellow leaders to see him through when they come under their own domestic pressure. So what should Cameron do? He could take being outvoted on the chin, hope for some consolation prize and pray that, next time, EU leaders will help him to deliver change. This is a risky approach. An alternative would be to send a direct message to his fellow leaders that he is not just in favour of EU reform but also believes that it is fundamental to the UK’s continued membership. Cameron could say that if the EU continues in the manner of Juncker’s appointment he will have no choice but to advocate an Out vote. This would be interpreted as a threat, and be greeted by a wall of hostility in Brussels – but it would have the benefit of being true. It is not an idle threat. Cameron’s plan to base his referendum on the potential for EU reform was the right one, and one from which he cannot back down. Nor can he back the UK’s membership come what may. If he tried to pull the Harold Wilson trick of presenting a few concessions as a major triumph, he will be found out. After over 40 years of EU membership, a cynical British public will not be fooled. Remembering that Cameron was unable to block Juncker will not help in this regard. Cameron has to succeed in EU reform if he is to advocate an ‘in’ vote – it is time others in the EU began to realise that and act accordingly, or it may be Out by default. If you force 26 EU countries to choose between Berlin and London. 26 will choose Berlin. The knife in the battle over the next Commission President has just been twisted a little deeper into David Cameron's side. Both Swedish PM Fredrik Reinfeldt and Dutch PM Mark Rutte today announced that they will not seek to block Jean-Claude Juncker for the top post. Both countries have huge reservations, (Sweden and Hungary were the only two countries to oppose the idea of Spitzenkandidaten from the get-go), but they apparently don't want to be standing on the wrong side of the fence from Germany. I’m set on [Juncker. He is] in a position to implement important Dutch wishes. A slight departure, then, from remarks Rutte made previously, that the Spitzenkandidaten process is “not my preference,” and that he wants to initiate a fundamental debate on it “possibly during the Dutch presidency” over the European Council in 2016. Under no circumstances, will I make agreements over adapting the fiscal rules, or making them more flexible, in order to make the nomination of a candidate possible. If Jean Claude Juncker musters a qualified majority amongst heads of state and governments, and also has the support of the European Parliament, well then, the rules set out in the Lisbon Treaty have been followed and Sweden will also join this majority. Though Reinfeldt doesn't actually state how he would act in an outright vote, it probably means he will not vote against Juncker. So that only leaves the Hungarian Prime Minister, Viktor Orban, on 'Team Cameron'. Orban said "there is no way" he would vote for Juncker, even before the European Parliamentary election. 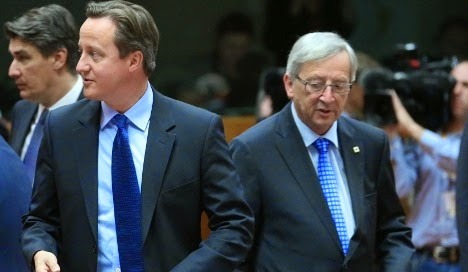 Absent changes, Cameron is now a long way off a blocking minority to Juncker in the Council. With Italy trading support for Juncker in exchange for more "flexible" EU fiscal policy, and the Netherlands and Sweden dropping out too, Cameron will lose the vote on Friday. This is the grim reality, even though most EU heads of state are far from convinced about Juncker, and of the Spitzekandidaten process itself. The top line is that if you pit London against Berlin, and ask other EU member states to choose between them, they won't choose London. The stakes are raised: Will Renzi and Hollande back Juncker even absent more lenient eurozone fiscal rules? As we anticipated on our blog last week, the discussion over Jean-Claude Juncker's appointment as next European Commission President has in part turned into a debate over whether the EU's fiscal rules - enshrined in the Stability and Growth Pact - should be applied in a more 'flexible' way. France and Italy are making their support for Juncker conditional on the new European Commission granting them more budget leeway while they push ahead with structural reforms, and Germany is reluctant to make concessions. This also matters for David Cameron's battle against Juncker, as an increasing number of Germans now see what can happen when Britain gets isolated and Berlin is left facing a Mediterranean bloc, armed with Qualified Majority Voting. It may be too late in the day for Merkel to U-turn, but it will definitely serve to focus minds in Berlin following this episode. 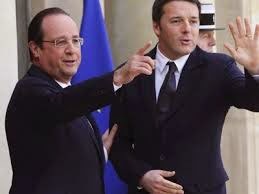 But could Cameron hold out hope for Italy and France? Renegotiating the Stability and Growth Pact seems off the table, and neither French President François Hollande nor Italian Prime Minister Matteo Renzi are actively calling for changes to the rules. The key is what each country means by 'flexibility'. Renzi wants to exclude a number of 'strategic' investments from EU deficit calculations. Hollande wants more time to cut France's deficit. And Merkel wants things to stay just as they are, because she thinks that the existing rules are flexible enough. "More debt only leads to a deepening of the problems instead of solving them." "It is for [EU] leaders to discuss a new course for Europe. Therefore, we are not concerned about declarations by this or that minister, even if from an important country." 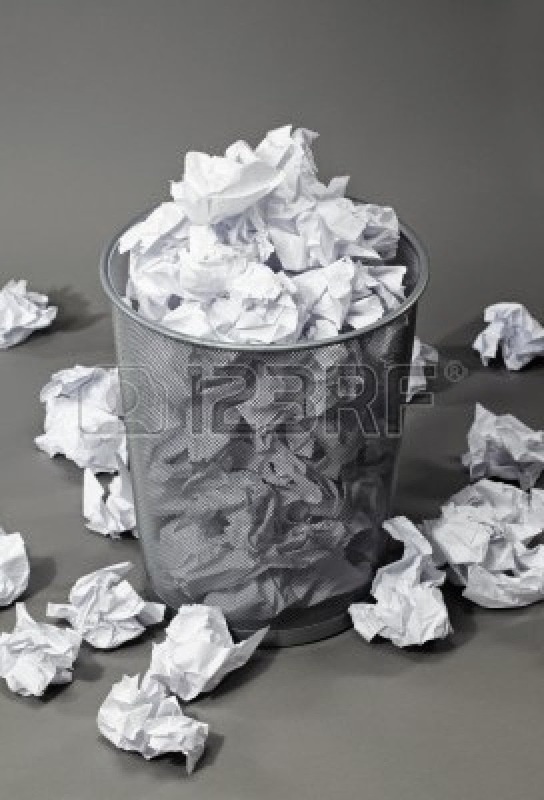 Meanwhile, Hollande yesterday circulated a paper outlining France's priorities for the new European Commission. The document, seen by Le Monde, calls for "an application of [EU] budgetary rules that favours investment and growth", while taking into account "the reforms undertaken by countries and their economic situation". "[EU fiscal rules offer] clear guard rails and limits on the one hand, and a lot of instruments allowing flexibility on the other. We must use both just as they have been used in the past." If a vote on Juncker eventually takes place at this week's European Council, Hollande and Renzi will have to abandon their convenient 'priorities first, names later' line and make a clear choice. Then the key question will be: do they think they have been given sufficient guarantees that their requests will be taken on board by the next European Commission? If the answer is 'No', Juncker's candidacy could still be struck down. It is going to be interesting but it'll take a major turn of events for Juncker to be dropped now. From democratic revolution to "back-room massacre": Is Germany's press already suffering from a Juncker hangover? Many of us have been there. Waking up on a Sunday morning. Head sore. Mouth dry. And not entirely pleased with our behaviour the previous night. "What was I thinking" type of thing. It seems like German media is there too over the, by now, highly-likely appointment of Juncker as a the next European Commission President. As we've argued before, no one particularly wants Juncker, but due a series of coinciding factors in the randomness that is EU bargaining, here he is. A significant chunk of the German commentariat - for reasons relating to the German conflicted political consciousness - have been the most vocal supporters of Juncker via the Spitzenkandidaten process. Cameron has been pitted against Germany. Except that a whole host of Germans were uncomfortable with the Spitzenkandidaten all along. As the moment of truth draws closer, influential German commentators are waking up to smell the coffee (to continue the hangover analogy). Hardly anyone considers Juncker to be the right candidate for the right time. The opposite is true. The almost 60-yr old eurocrat is symbolic of a Europe of elites, which the citizens turned their back on in the [European Parliament] elections in May. Both in terms of substance and style, Juncker's European politics represent "more of the same," and [they] subscribe "more Europe" to deal with every problem...[But citizens] definitely do not want "more of the same. Whoever wants the new Commission to change course, ensuring a better balance in the tug-of-war between the national parliaments and Brussels cannot be satisfied with [Juncker's election]. Juncker's appointment takes the UK one step closer to Brexit. This would be a disaster for Britain, but also for Europe. Without Britain we will not be able to maintain a liberal economic outlook, but more importantly, [we’ll also lose] political clout on the world stage. By allowing Juncker to win the job, Reicke continues, that a dangerous precedent is being set: formalising a power-grab by the European Parliament at the expense of the European Council. Reicke concludes that Merkel "will be responsible if Europe allienates itself further from citizens with the election of Juncker." This is what a perfect political trap [by the European socialists] looks like. Nobody should blame the British David Cameron for the conflict: those raging in anger are, of course, not loved. But at least he speaks frankly from his heart. What started as a democratic exercise four weeks ago now ends in a real backroom massacre. This can only further damage the European institutions and the people working for them. The honest answer is: these elections have only produced losers so far. So it doesn't appear to bother the Socialists to wade-in even deeper. The Conservatives are stuck with an unloved Spitzenkandidat for who's election they will still have to pay a price. What were the European elections about? If you believed the slogans of the parties, they were about a Europe of opportunity - not unemployment; a Europe for citizens, not for money; a Europe of democracy -not paternalism. And naturally for the "European Peace Project"... But in reality, they were about something completely banal: posts and power-plays, to forward the career of two eurocrats, who are partly responsible for the situation in which Europe finds itself, and therefore, especially qualified to continue with this tone and direction. It's completely irrelevant whether Schulz becomes the President of the Parliament, or Juncker becomes the President of the Commission, or vice versa. Or even if they both take over the management of the Brussels brassiere - Schulz on even and Juncker on uneven days. The "elections" were a hoax, the ensuing-struggle is the same. That is why I want my vote back. Even Bild, who were campaigning to instill Juncker, seemed to semi-endorse Danish PM Helle Thorning-Schmidt last Friday, with the headline: "Why isn't this fantastic Dane becoming the Head of the EU?" and continuing that her appointment "would end the tussle over Juncker." Can journalists please stop referring to Sikorski as "Cameron's ally"? 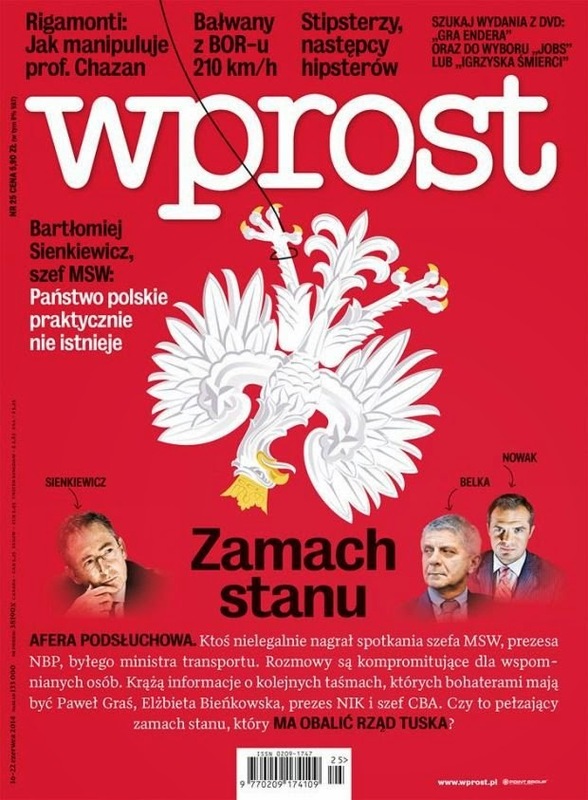 The leaked conversation in which senior Polish politicians including Foreign Minister Radoslaw Sikorski savage Cameron's EU strategy - exclusively translated into English by Open Europe yesterday - is all over the UK press today. Many of the stories have headlines refer to Sikorski as a key "ally" for David Cameron, but as we have repeatedly argued, this has long not been the case; in January, we pointed out in the wake of the row over free movement and EU migrants' access to benefits that "It isn't Brussels that David Cameron should worry about in Europe at the moment – but Warsaw". Despite being a university friend of David Cameron and Boris Johnson's [insert obligatory Bullingdon club reference here], as well as an Anglophile and self confessed Thatcher fan, Sikorski has never been an ally on EU reform. Poland has its own interests in the EU to look after - and in recent years it become more assertive and effective in doing so - it is under no obligation to support the UK (this is after all what playing the EU game is all about). Poland considers its membership of the EU as its best guarantee of security - especially following recent events in Ukraine - and therefore sees any attempts to 'weaken' it as inimical to its interest. However, Sikorski has not only not supported the UK, he has gone out of his way to undermine Cameron's reform agenda, for example by painting it in 2012 as an attempt to "wreck and paralyse the EU". It is true that more recently his tone and rhetoric has been more constructive - in April he said that Poland would be "perfectly willing to help [the UK] fix some of the problems of the EU”, but even his only specific suggestion was fixing the Working Time Directive. The WTD is certainly a significant issue which needs to be addressed but its hardly the most pressing problem facing the UK within the EU and it misses the point that there is a much wider critique to be made of how the EU currently operates. Indeed Sikorski's wider rhetoric - “Britain is a great victor of the EU" is implicitly dismissive of these concerns and only serves to sustain the perception that of an out of touch, arrogant EU elite. Despite their differences over the key issue of free movement, Poland and the UK continue to share strategic interests in a number of areas from free trade, better EU regulation, energy policy, rights for non-euro members (it'll be a long time before Poland can join) and Russia/Ukraine. International diplomacy remains above all else a pragmatic business. However, just because Cameron and Sikorski used to be Oxford drinking buddies, it does not mean they are natural allies on EU reform. Nomina sunt consequentia rerum. Names are a consequence of things. Italian Prime Minister Matteo Renzi quotes Emperor Giustiniano and Dante Alighieri to open the paper he wrote together with Europe Minister Sandro Gozi, outlining Italy's priorities for the next European Commission. The document has been published by Europa, an Italian daily close to Renzi's Democratic Party. And it's in English, so you can read it in full here. The election to the European Parliament, the constitution of the new Commission, the designation of the new President of the European Council mark the beginning of a new political cycle. We can turn it into a fresh start for Europe. Nothing could be worse than [to] roll out with an inter-institutional wrangle over the top European jobs. This would be utterly incomprehensible to European public and irresponsible in the light of the huge challenges ahead. Therefore, as we already wrote on this blog, Italy is not keen to start its rotating EU Presidency with a big fight on top jobs. Fiscal consolidation is still challenging in spite of the unprecedented efforts, because of subdued growth and very low inflation...Benefits from reforms in terms of growth and jobs take time to materialise...The European economic framework should back reforms agendas in member states and strengthen incentives for reforms. The full potential of the internal market also needs to be exploited, including in the field of services and energy. We should move towards a real single market for electronic communications and on-line services. Improve the quality of EU legislation, reducing EU regulatory burden...More generally, the implications for growth should be factored-in in all legislative proposals and discussions. We need to give a better sense that the EU institutional setup is at the service of European citizens' needs...EU institutions can already adopt some practical arrangements to improve their capacity to deliver. In this respect, the possibility of creating clusters of Commissioners, one for each European priority, should be seriously taken into consideration. We need to promote a more proactive role of the EU and more integrated policies in the fields where they have a clear added value. Immigration and asylum is clearly one of those fields, In one word, we need to promote an authentic Common European Migration Policy. The job description for the EU top jobs stems from this outline. Italy will support leaders that share our views on the future of Europe and are determined to foster the above priorities. As we previously noted, Italy can play a key role in the appointment of the next European Commission President - especially if EU leaders hold a vote at this week's European Council. Renzi is not against the principle of Spitzenkandidaten being chosen by the main pan-European political families, and has never given signs of having a 'personality problem' with Jean-Claude Juncker. 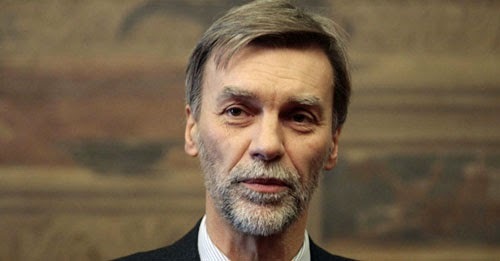 Therefore, the key will be whether the Italian Prime Minister considers Herman Van Rompuy's vague list of priorities and Angela Merkel's very timid 'opening' on eurozone fiscal rules as a sufficient guarantee that Italy's concerns and requests will be taken into account by the next European Commission. 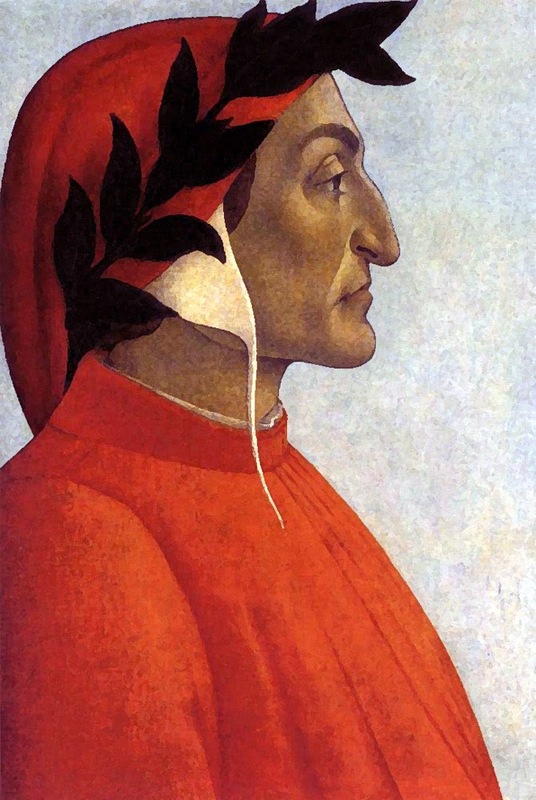 Renzi has now set out a pragmatic negotiating stance ahead of complex discussions. He has also produced a clear metric by which to judge his success or failure. Even if you do not agree with everything he is calling for, such clarity is welcome. 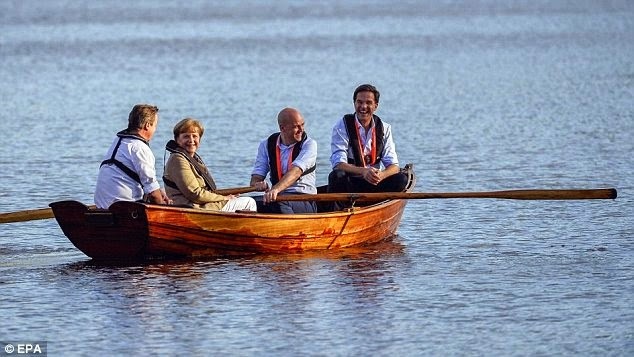 Is this really the best EU leaders can come up with? The continuing furore over whether Jean-Claude Juncker will this week be crowned European Commission President has diverted attention away from the important issue of what he, or whoever else eventually gets the job, will be expected to do. Like most others, we have seen a copy of a draft statement from EU leaders, expected to be announced at the conclusion of this week’s summit, setting out a “strategic agenda” for the EU for the next five years. Clearly, the futures of young people in Europe is of huge importance, but surely this is a matter for national governments - what will the 'EU', in the narrow sense, do in terms of policy to help school drop outs? Similarly, the document talks of making “our social protection systems fit for the future”, an area of public policy explicitly reserved for national governments. What happened to the Dutch mantra “Europe where necessary, national where possible”? The next five years risk starting off with the same hollow commitments and lack of focus – responsibilities should be clearly divided and it should be clear where member states and/or the EU will take the lead. There are some more positive elements for Cameron, such as a commitment to “complete negotiations on international trade agreements, including TTIP, by 2015” and tackling “at all levels” the abuse of labour mobility. "The integrity of the single market and openness towards non-euro EU countries should be preserved." How exactly this will be done is unclear but the formal acceptance of the euro vs. non-euro split as an issue is at least a start. That said, there is also an extended list of foreign policy commitments, such as "promoting stability", strengthening a common defence policy, etc, which could have been copied and pasted from any such document from the last 15 years. All in all then, this is not an inspiring first draft. Much work needs to be done to improve it. This dispute is largely the product of the wording of the Lisbon Treaty. One part states that the election of the Commission President is the joint responsibility of the European Parliament and the European Council; another that the European Council shall “propose” a candidate to the parliament for election. David Cameron was entitled to take seriously the widespread support on the Continent for his speech last year in which he spelled out the need for EU reform. He was also entitled to assume that the selection process would be led by elected leaders of member states, rather than dictated by the largest “political group” in the European Parliament. The absurd portrayal of Mr Juncker as the champion of pan-European democracy is a cloak for German indecision and the failure of nerve of several EU leaders in the face of the European Parliament’s ambition to replace national democracies with its own ersatz alternative. Mr Juncker’s appointment would be a bitter blow to the pro-European cause in Britain, bolstering the Outists’ line that the EU is unreformable. As far as leaked tapes are concerned, this is extraordinary - and Open Europe offers the first translation of it all. Poland has been rocked by a political scandal involving the covert surveillance of senior government ministers, state officials - including the governor of Poland's Central Bank Marek Belka - and business figures, and recordings of their conversations were leaked to Polish magazine Wprost. The whole business is distinctly shady - who did the recording and for what purpose (some have suggested Russian involvement) - and could yet lead to early elections. It has also revealed how Polish politics operates behind closed doors and shed light on what senior figures really think about a range of issues, including UK-Polish relations in the context of the EU. We have highlighted before that this is a crucial bilateral relationship, the health of which will have a significant impact on the success or otherwise of Cameron's EU reform agenda. Unfortunately, this relationship has become particularly strained in recent times, particularly over the related questions of free movement and access to benefits. Here are the key sections of a conversation between Foreign Minister Radoslaw Sikorski and former Finance Minister Jacek Rostowski at some point this spring (we try to keep this blog family-friendly so apologies for the bad language). Rostowski: “For the Polish government to agree, someone will have to give us some mountain of gold. The Brits won’t give it to us, and the Germans, in order to keep the Brits on board, won’t give it to us either in all likelihood. So the answer will be: f*** off... [the impact of a Brexit] will generally be bad for us, because we would like for Great Britain to stay. I think it’ll be the case that [Cameron] will lose the elections. Great Britain will leave. Once they do, they’ll keep open borders. Not for [gypsy] beggars…"
In a separate conversation with Jacek Krawiec, head of Poland's largest oil and gas conglomerate Orlen, Pawel Gras, Prime Minister Donald Tusk's then media spokesperson referred to a phone conversation between Tusk and Cameron in the wake of Cameron's comments about Polish migrants claiming benefits in the UK. Krawiec: “What the f*** are they on about with these benefits? [Cameron] seems like a really sensible bloke... when I met him in London he talked a lot of sense”. It is notable that Rosowski assesses the prospects of Brexit as highly likely, and how resigned both he and Sikorski are to that outcome even while admitting that it would be bad for Poland. As such, it is outright bizarre that they are so flippant and dismissive about Cameron's reform agenda - which - for all its flaws from a Polish perspective - remains the best chance for keeping the UK in the EU from a wider perspective. Both Rostowski and Sikorski are adamant that even in the event of a Brexit, the UK will not be able to block free movement - if it wants to maintain access to the single market - a key demand of many better off outers (Switzerland is currently facing this dilemma). As the Krawiec comments demonstrate, when addressing issues of substance, Cameron can count on a good hearing from Polish business leaders, a crucial constituency, but he risks alienating Poles by ill-judged claims about 'benefit tourism'. In conclusion, international diplomacy remains rooted in pragmatism and it is unlikely this incident will result in long term damage between London and Warsaw. It is also worth mentioning that these conversations could well have taken place before the escalation in the Ukrainian crisis which has helped to firm up Polish-British relations (with the UK taking a tougher position on sanctions than other EU member states and sending RAF fighter planes to the region). However, it is clear that issues like EU migrants' access to benefits - something UK public opinion will simply not allow Cameron - or indeed any other UK Prime Minister - to ignore. It is crucial therefore that both governments put aside the hyperbole and think about how tricky issues can be resolved in such a way that benefits both countries. 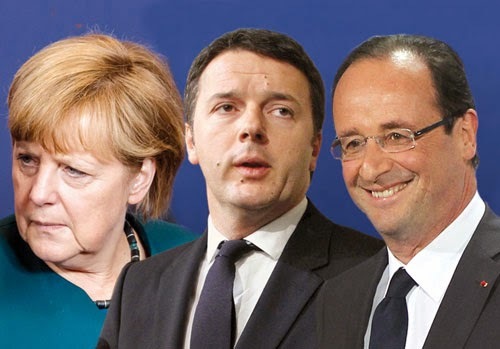 Could France and Italy provide Merkel with an excuse to drop Juncker? The appointment of Jean-Claude Juncker as next European Commission President is often boiled down to a stand-off between David Cameron and Angela Merkel. And it looks increasingly likely that there will be a vote on Juncker as early as at next week's summit of EU leaders. He is still the favourite to land the job. However, Juncker's road to the Berlaymont building is unlikely to be incident-free, and a degree of unpredictability remains. Over the past few days, France and Italy have made clear that their support for any candidate to the European Commission Presidency is tied to a substantial change in EU economic policies. French Europe Minister Harlem Désir held talks with his Italian counterpart Sandro Gozi in Paris yesterday, to refine a common strategy. Furthermore, France will host a mini-summit of the seven centre-left EU heads of state and government tomorrow, to discuss their priorities for the new European Commission. The proposal Paris and Rome have been working on is clear: growth-enhancing investments and the cost of structural reforms should no longer count as deficit under EU rules. Merkel has so far resisted the proposal, but Vice-Chancellor Sigmar Gabriel - of the SPD - has come out in support of giving more budget leeway to countries that undertake a wide-reaching reform process. Unlike Cameron, neither French President François Hollande nor Italian Prime Minister Matteo Renzi seem to have a personality problem with Juncker. Nor have they openly criticised the principle of Spitzenkandidaten. But there is a chance they could end up on the same side of the debate, although for different reasons. There are many factors at play here. But if Hollande and Renzi push it too far and make it clear that the price of their support for Juncker is a weakening of the eurozone's fiscal rules, they could provide Merkel with an excuse to drop Juncker, sacrificed on the altar of German budget discipline. That would make such a decision more acceptable to the German public, surely? Is Bild having second thoughts about Juncker? If Angela Merkel had privately hoped to quietly ditch Jean-Claude Juncker after the European election, it all started to go wrong when Axel Springer, the media group that owns Bild, Germany's and Europe's biggest selling paper, added its substantial weight to the pro-Juncker/pro-spitzenkandidaten campaign. This severely restricted Merkel's room for manoeuvre. While Bild's editorial line has not changed explicitly, today's coverage of the issue is notably less enthusiastic. The paper's Brussels correspondent Dirk Hoeren asks "Will the Juncker deal be a dirty one? ", with his piece claiming that France and Italy have made their support for Juncker conditional on a relaxation of EU budgetary rules (unlike Cameron who has taken a principled stance). If you believe in tight observance of budget rules, as most Germans do, the last thing you want is to have a Commission President, appointed on a 'pan-European democratic mandate', who supports relaxing German-inspired rules on budgetary stability and the introduction of eurobonds. While Juncker might need French and Italian support, ultimately he is the EPP candidate and Merkel is likely to bring her influence to bear. But imagine if 'centre-left' parties with a more avowedly Socialist spitzenkandidat were to win in future. How would Germany respond then, particularly the 'centre-right'? Would it be a case of yes to pan-European democracy, but only if the 'right' candidate wins? It seems like some people are starting to wake up to this prospect. Nigel Farage has managed to form a new Europe of Freedom and Democracy (EFD) group in the European Parliament. The group comprises 48 MEPs from seven EU member states. The anti-immigration Sweden Democrats and the Latvian Farmers' Union both joined forces with UKIP. But the story of the day is that the seventh nationality Farage needed to wrap up his group has been provided by...a French MEP who defected from Marine Le Pen's Front National. Joëlle Bergeron (see picture) was elected to the European Parliament with Front National last month. However, according to her, she came under pressure to give up her seat to another member of the party deemed as more 'orthodox' and closer to Le Pen. 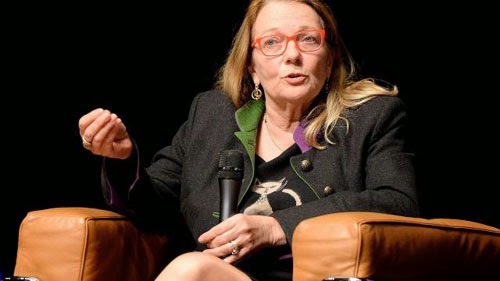 A couple of days before the European Parliament elections, Madame Bergeron had raised a few eyebrows in Front National's leadership by speaking out in favour of giving immigrants the right to vote in local elections in France. She eventually decided not to step down as an MEP, but she quit Front National and joined UKIP's group. How these parties will coexist remains uncertain. For example, UKIP wants to quit the EU, and Beppe Grillo’s Five-Star Movement is a rather unpredictable quantity that doesn’t want to leave the EU and supports a financial transaction tax. Indeed, the fact that parties will be allowed to vote independently on each specific issue could help make the alliance more sustainable. As we noted in a recent briefing, European Parliament rules mean the EFD group - as all the others - will be entitled to millions of subsidies every year. According to our estimates, based on 2012 figures, Farage's new alliance could claim in total around €5.6 million a year - €3.8 million for the group in the European Parliament, and €1.8 million for the affiliated pan-European political party and foundation. UKIP is not a member of the latter two, so it will only be entitled to a portion of the money specifically devoted to the European Parliament group. So Nigel was faster than Marine, but Le Pen still has a good chance of forming her own group. 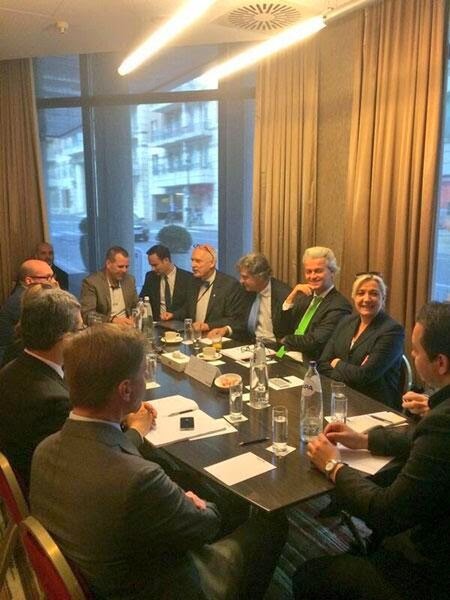 She was in Brussels yesterday for a meeting with her new allies, and Polish MEP Janusz Korwin-Mikke was sitting at the table (see picture) - most likely a sign that Poland's Congress of the New Right (KNP) is on board. This means Le Pen only needs one more national delegation to finish the job. Difficult, given that the deadline to register new groups expires next Tuesday, but definitely not impossible. 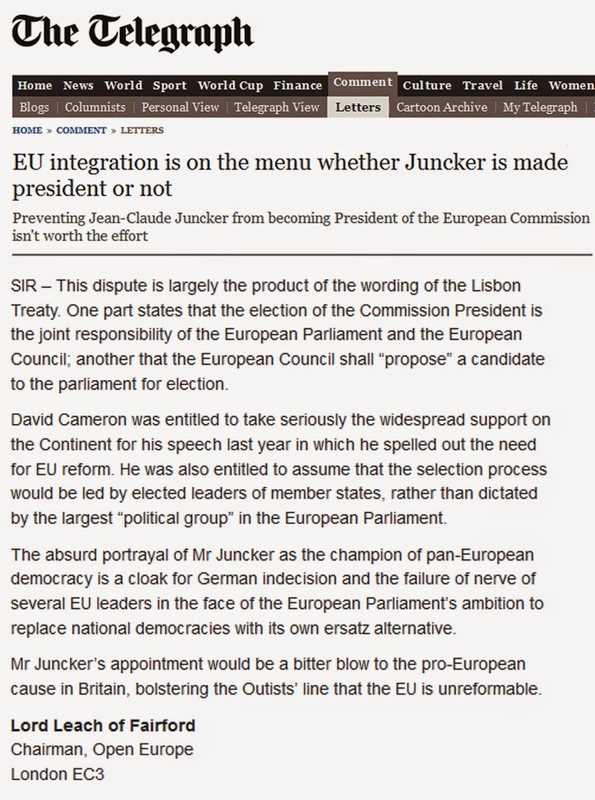 There's something quite ironic going on in all this Cameron-bashing over Juncker. 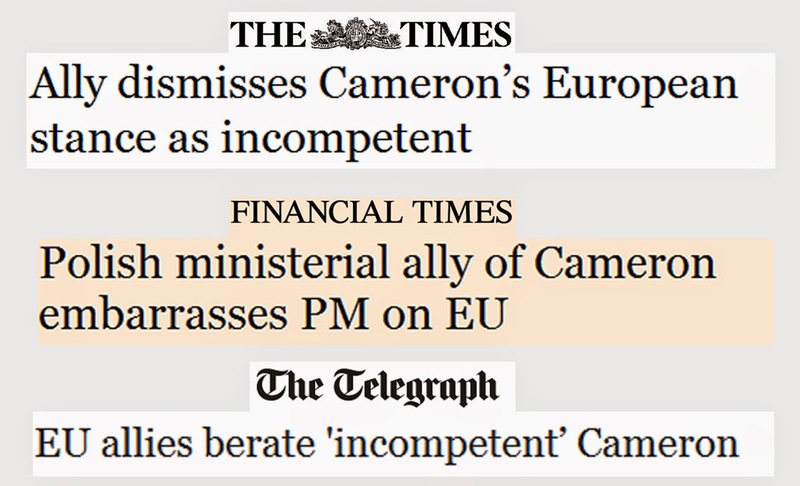 The charge against Cameron in Europe (and also at home) is often that he lacks principles. That he's pushed around by backbenchers or pursues narrow tactical personal or national interest. Now that he has come out fighting for a principle - in this case whether powers should be arbitrarily transferred to Brussels and key decisions made by a fledgling transnational parliament with very limited democratic support, rather than democratically elected national governments and parliaments - he's being accused of blundering diplomacy. Yes, of course, Cameron could have done things differently. But if he believes that the principle is wrong, can you blame him for, as he says, fighting "until the end". In contrast, Angela Merkel - who's a formidable power politician and who we have a lot of respect for in general - is flip-flopping like crazy over Juncker. And Matteo Renzi, the Italian PM, is busy striking back-room deals to let Italy off the hook on EU budget rules in exchange for backing Juncker. On this occasion, Cameron wasn't even pushed around by his own backbenchers. In fact, Better Off Outers would probably love to see Juncker become President as it'll strengthen their cause. Also, some sceptics see this as a "pointless battle." So, Cameron seems to be taking a genuinely principled stance even if it comes with a political price. In a sense, one could argue that, rather than the Spitzenkandidaten process falling victim to British politics, Cameron has fallen victim to German domestic politics. "The fact that there were candidates for the post of the Commission President is a fact created in the political realm, however with little proven resonance by the voters. This fact is neither legally nor politically binding for the Council’s suggestion [of the Commission President]." "Those who resent the British Prime Minister for having an opinion on personnel-related issues did not understand the system. Those who demand the British exit or approvingly accept it because the UK does not want to follow rules which are not to be found in the [EU] treaties want a different Europe than what is laid down in the treaties." "More centralisation in some areas is possible, but one has to soberly discuss the repatriation or a better separation of powers in areas such as labour and social law. Relevant proposals from the Netherlands or the UK should not be immediately viewed suspiciously as re-nationalisation programmes." It’s not shaping up to be a great month for the UK government with respect to the EU – a pretty poor showing at the European elections, a looming defeat over the Spitzenkandidaten process and now, just to top it off, a troublesome legal opinion from the European Council legal service. 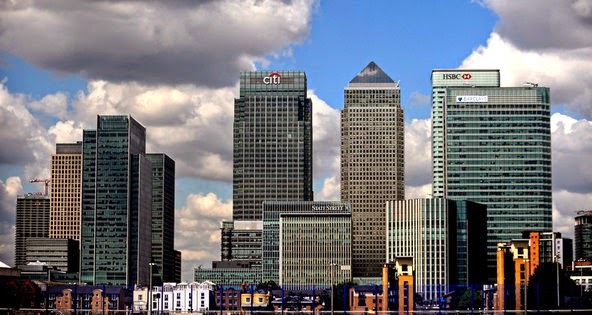 The FT and Reuters overnight reported on a leaked legal opinion from the European Council legal service which looks at the new rules on proprietary trading and the structural reform of the European banking sector published in January. As a reminder, these proposals are the offspring of the Liikanen report and we covered them in detail here. The wider political importance of these reforms relates once again to how much control the UK can retain over how to structure, regulate and, by extension, supervise its own banking sector (which, lets not forget, it continues to backstop alone) in light of further eurozone integration, which it cannot be part of. And whether the EU can be flexible enough to accommodate this. Firstly, any derogation under the single market article (Art 114) should be “temporary” according to the treaty. Since the derogation seems to be permanent it falls foul of the treaty here. Secondly, allowing for exemptions here breaks Article 288 of the EU treaties because it stops the “general application” of a regulation across all member states. It also falls foul of the “uniform application” of regulations across member states. Thirdly, the legal service does not buy into the justification for the derogation, suggesting that the costs of changing legislation to meet EU rules would not be prohibitively high. This sets it apart from previous instances where objective justification has been given. Furthermore, the use of the derogation is reliant on member states making an application and does not rely solely on the Commission. Fourthly, the derogation only applies to countries where similar legislation has been passed before 29/01/14 – the opinion stresses that no justification is given for such a date and calls for more explanation. This cut-off date also means the exemption applies differently to certain countries which happen to already have passed their own legislation. On top of this, it only applies to certain credit institutions. Finally, since the exemption essentially allows national law to take precedence, it questions the primacy of EU law. The legal services suggest a number of remedies including: allowing the derogation for a specific temporary time period, clearer justification for the cut-off date, adopting the legislation as a directive rather than regulation (allowing for greater national flexibility) or dumping the derogation altogether. As we noted previously, the target adoption date for these rules is January 2016 and there are plenty of negotiations still to come, as such this opinion, while a blow to the UK, is the not the end of the discussion by any stretch. As the remedies suggest, there are options open to the UK and others for adjusting these rules. Furthermore, there are plenty of other controversies in the rules, such as how to properly define proprietary trading and how all the technical standards are defined. This one will run for some time still. Germany reacts to ECR vote "Britain knights AfD"